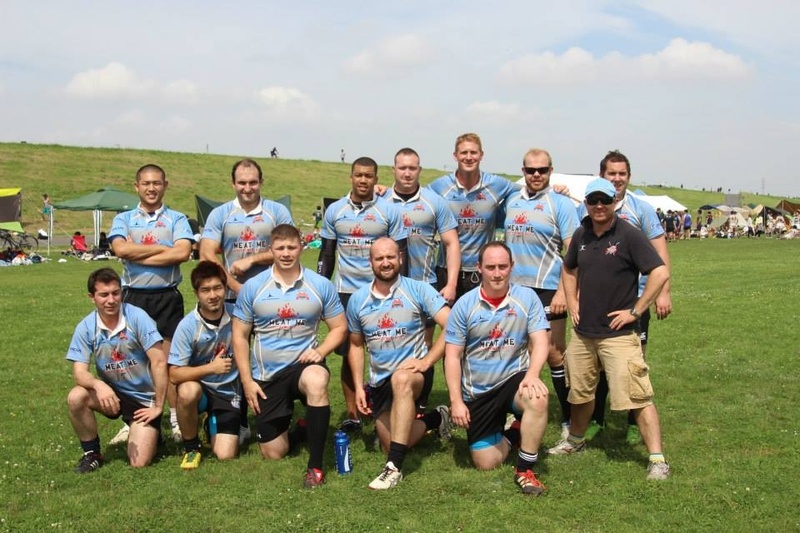 The Shuto League HUB 10s Tournament. As is wont to happen in midsummer,… the day was a blinder and way too hot for rugby. 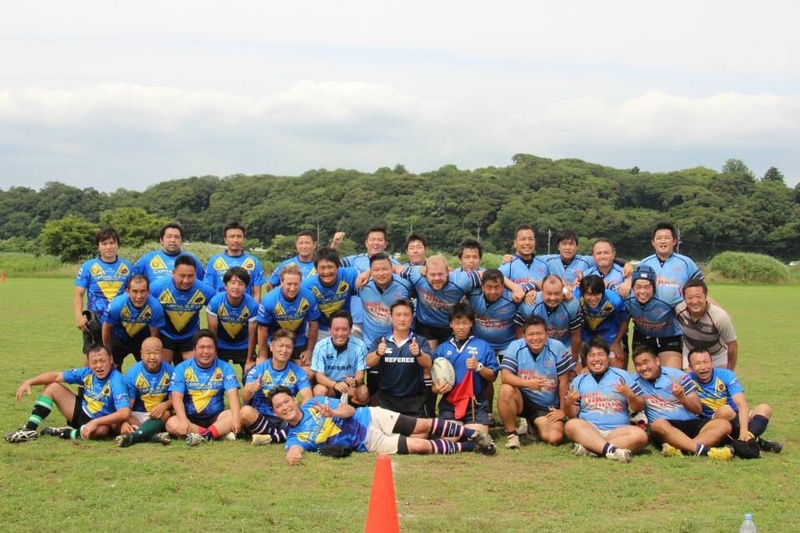 Nevertheless, 20 players and 5 supporters turned out to the Edogawa Undojo rugby ground pretty much on time at 08:30 in the morning of the 6th of July to get kitted out for the opening ceremony at just before 9am. Standing in rows, the 24 teams looked pretty good in team colours as the officials kicked the day off. Last year was a bit of a disaster, but this year was going to be different for us, as we had the numbers and the organisation to put forward a good challenge for the Cup. Our game was the first one on the roster and we felt ready for it. We finished top of the table on the ‘A’ Ground block of 12 teams. While the lads were taking a well deserved rest and lunch break, the Shuto committee team played a 15-minute exhibition game of 15s against a selection of props from the other teams – our prop, Marc, played halfback of all positions, and now has a new-found ‘respect’ for the No 9 jersey. Tooley tried his best under the midday sun, but not having played in a few months, later stated that his match fitness was ‘slightly’ lacking… another classic understatement. Once again, we were first cab off the rank in the afternoon tournament session….. which was to be our demise. Our team manager and the opposition team manager had neglected to tell their teams that the knockout phase of the tournament included conversion kicks. They left that to the ref, who also had not realised until 10 minutes after the game, which had ended in a ‘draw’ and gone to a deciding ‘touchline kick’. A kick that we lost. It was suggested by our manager that the conversion kicks be taken. However, this was rejected by the opposition as our kick was in front of the posts and theirs wasn’t… go figure. It was decided that the original result would stand, so we went back to our just-opened beers and tried to make the most of the rest of the tournament, which was a tad painful to watch, knowing that we still could have been in it. Needless to say all the following teams took their conversion kicks…..
Apart from that little ‘hiccup’ in our plans, it was a rather successful day of rugby for us, and we will have a bloody good bash at getting it right next year. Surprisingly, nobody got heat stroke, probably due to the fact that most of the lads spent most of their time under the Cru ‘tent’, hiding from the relentless sun. The winner this year was the Hurricanes RFC, a guest team and a lively bunch of OBs from Nihon University. We had 4 new guys come out and play for us in Yosuke, Pierre, Dominique, and Diamond, and we hope you come back in September and continue playing for the Cru. A big thanks to Aiko W and Aiko S for their support and work throughout the day.